I hope you all have a spooky spectacular Halloween! Snow Fairy shower gel is one of the most famous Lush products without a doubt. However, the downfall is- it only comes out at Christmas! I received Snow Fairy last Christmas from my Dad after I was so eager for it but I forgot to take a photo of it! What a huge blogging mistake. So here you'll just have to put up with the photos that I have taken from Lush's website. As most people who have tried this shower gel: I love it. The colour is a pretty pink and the name is perfect for it. As for the smell: it smells great! If you've used the Bubblegum Lip Scrub (an essential of mine) it smells exactly like that. But for those who don't know what that smells like it is basically like sweet candy and bubblegum. You can buy Snow Fairy in 3 different sizes: £3.75 for 100g, £7.50 for 250g and £11.95 for 500g. I had the biggest size and let me tell you- it lasted for ages! I started using it after Christmas Day and it lasted me until May. As Snow Fairy is so popular, hurry to get it! Also, if you really like it then stock up because like I said: it only comes out at Christmas. I for one absolutely adore this shower gel and I have never been so excited over a shower gel in my life. I 100% would recommend it and I would also certainly recommend it as a gift for a friend. Have you used Snow Fairy? What do you think? Let me know! 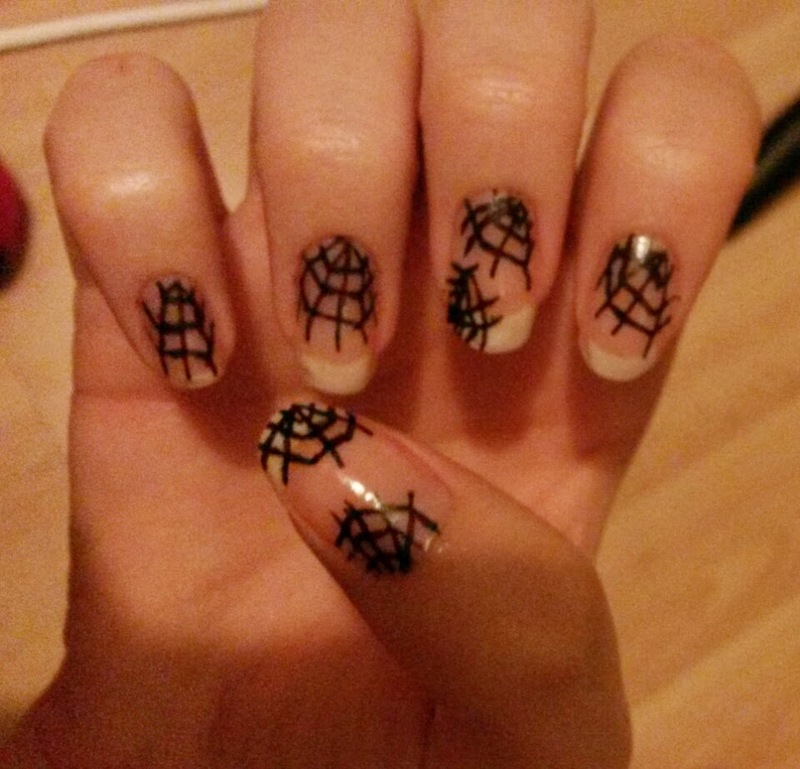 Here is another Halloween nail art idea for you: Spiderwebs! 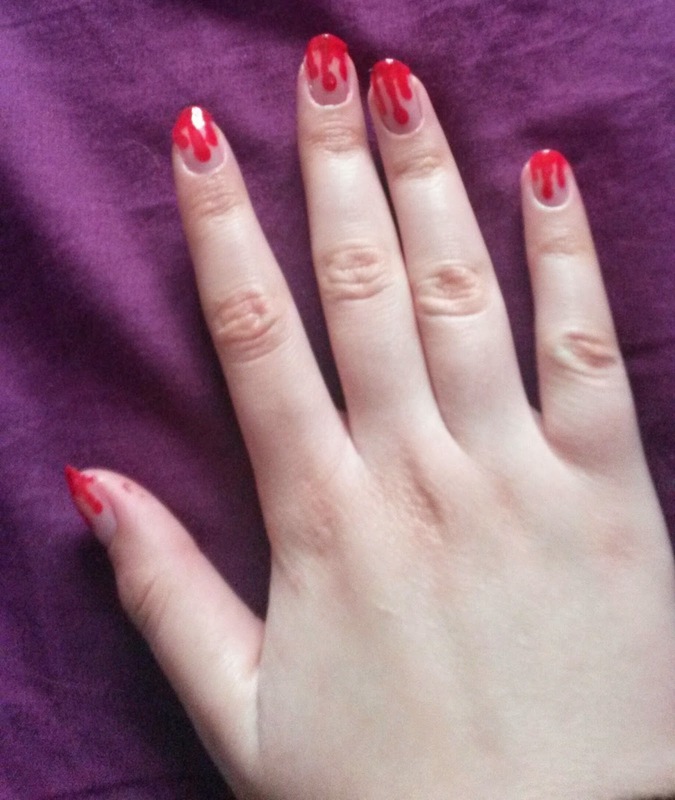 To check out my other Halloween nail art blog post (dripping blood), click here. A black striper/Toothpick with black nail varnish on/Black nail art pen. 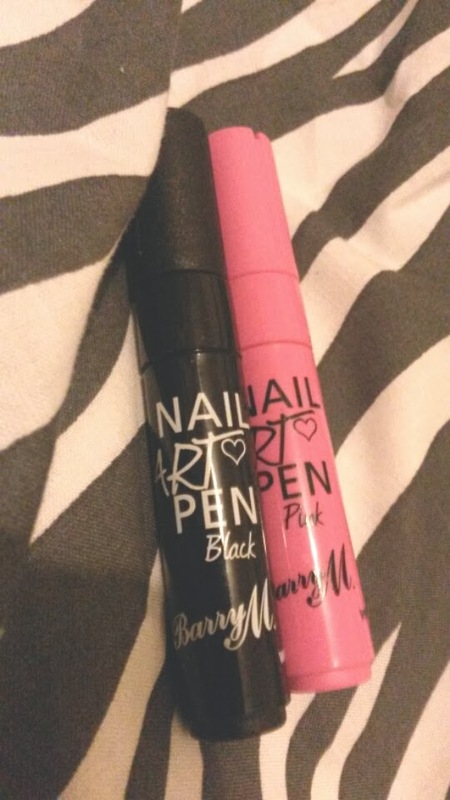 I used the Barry M black nail art pen. 1. Start in the corner of the top of your nail. You need to draw an inner shape first. This kind of looks like a circle but has three points to it, kind of like this: /-\ but with the '-' along the top and the same length as the other sides. Perhaps google images of cartoon spiderwebs for inspiration. 2. Draw another one slightly bigger above it with a slight width in between. Repeat this with an even bigger one above those two with the same width in between. Make sure the sharp points go above one another in the same line so you would be able to draw a straight line through them. 3. From the middle of the smallest /-\ draw a straight line that goes up through the middle of the web and out. 4. Similarly, start a line from underneath the first /-\ but underneath one of the points. Draw a straight line that goes up through all of the points in line with the bottom one and out. Repeat this for the other point on the opposite side. 5. Optional: You could draw some spiders! Draw a straight line down one of your nails that finishes just before the midde of your nail. Then, make a black spot at the end of it for the spider's body.Add four small lines on either side for legs! And that's it! It sounds really complicated when written down but if you have a look at my nails and perhaps some cartoon cobwebs you'll understand what I mean. I only used a base coat underneath the spiderwebs as I wanted them to show on my natural nail but you could do a white base coat first and then the black spider webs! What is going to be on your nails for Halloween? Let me know! Here is an Outfit of the Day post which I wore a week or so ago. I don't particularly have a favourite movie for Halloween but I absolutely adore the TV series Supernatural which I think would be a good choice for Halloween. Demons and other creatures galore! I have absolutely no idea! I didn't used to go trick or treating too much as my siblings/Mum were always reluctant to take to me. I was probably around 9 years old. 3. Favourite Halloween costume you have worn? A couple of years ago I dressed up as a bloody nurse. I had an awesome bloody nurse costume with bone sticking out of it and I bought some long white stockings with blood on to match. I then painted my nails red and drawn some white crosses on it like a hospital sign! I was pretty proud of myself. Also, when I was younger I won the best dressed competition as a devil but the day after I had a massive allergic reaction to the red face paint I had all over my face! I am not sure what I am doing for Halloween. I haven't done anything for Halloween for a while as I have been on holiday in that week usually so I am unsure. I will certainly ler you know what I do if I chose anything! 5. Do you like going to haunted attractions? I have never been to one before but I certainly wouldn't mind a spooky night out. It would make great fun with friends! Vampires always. Vampire films/books are my guilty pleasure! There is something about vampires I just find so...attractive. When I was younger I used to really like Haribos and the orange or strawberry flavoured lollipops. I wouldn't be able to have a lot of the Halloween treats now like I used to as I am now vegetarian and a lot of them have gelatin in but I can still enjoy some of the lollipops! 8.Do you decorate your house! I don't decorate my house but because I live in a street full of lots of children who come trick or treating I like to put up a scary sign on the outside door written in red and put the Halloween treats in a pumpkin bag which I used to take out trick or treating with me. I think my least favourite would have to be the devil one again! Although the outfit was cool, my skin was red and swollen from that face paint for weeks after! No fun! 10.Have you ever repeated a costume and what was it? When I was younger I used to repeatedly wear a witches outfit and if I cannot think of anything to wear this year I will probably repeat the bloody nurse outfit again. 11.Do you believe in ghosts? No I don't believe in ghosts. I have family members who claim to have ghost experiences but for me personally I do not believe they exist. I have never had a scary Halloween experience. The only thing I can think of is when I was younger I went to my sister's boyfriend's family Halloween party and they had cobwebs all over the ceiling with fake spiders in. However, we all knew they had a pet tarantula so they tricked us by telling us kids that they let their pet one out too! We were all screaming. I tag my awesome friend who I have been trick or treating with before Emily,(www.emilyfrancesx.blogspot.co.uk),Alicia from Alicia-a-la-mode and finally Ellie from beautybyelliee. Thanks! 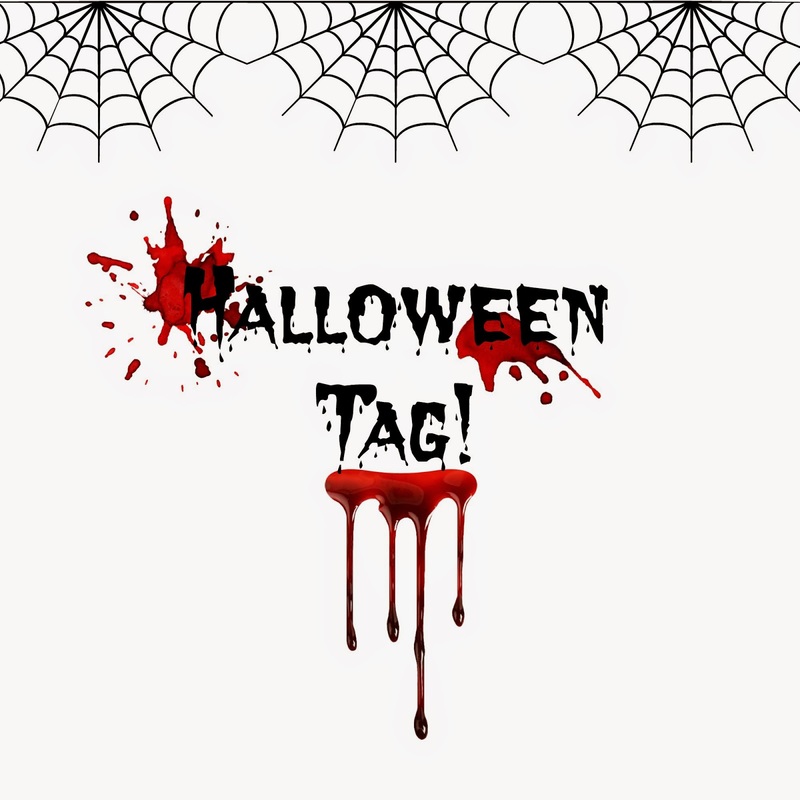 What are dressing as for Halloween? As promised in my Lush wishlists, if I bought or received any of those on my wishlist I would review them. Well the time has come already! I took a trip to Lush the other day and managed to limit myself to only two products. 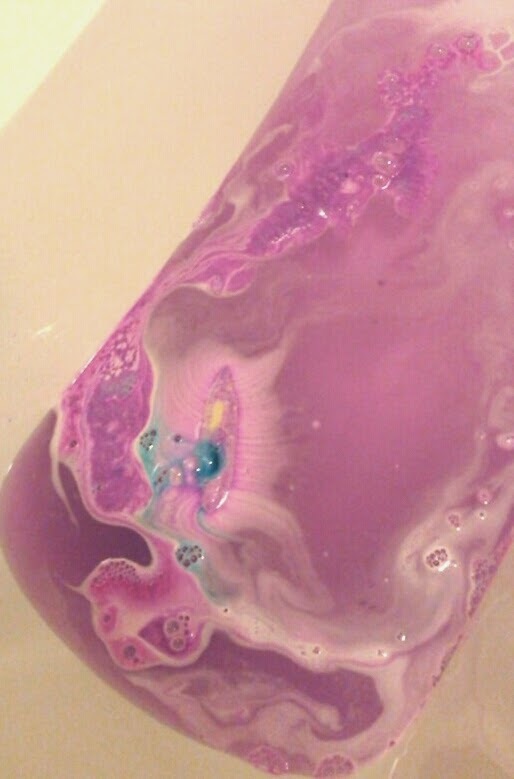 One of which I used that night so here it is: The Northern Lights Bath Bomb. As you can see, it is different to other bath bombs as it is a long one rather than a ball. It is for Fireworks night and with the name Northern Lights I knew I wouldn't be disappointed. 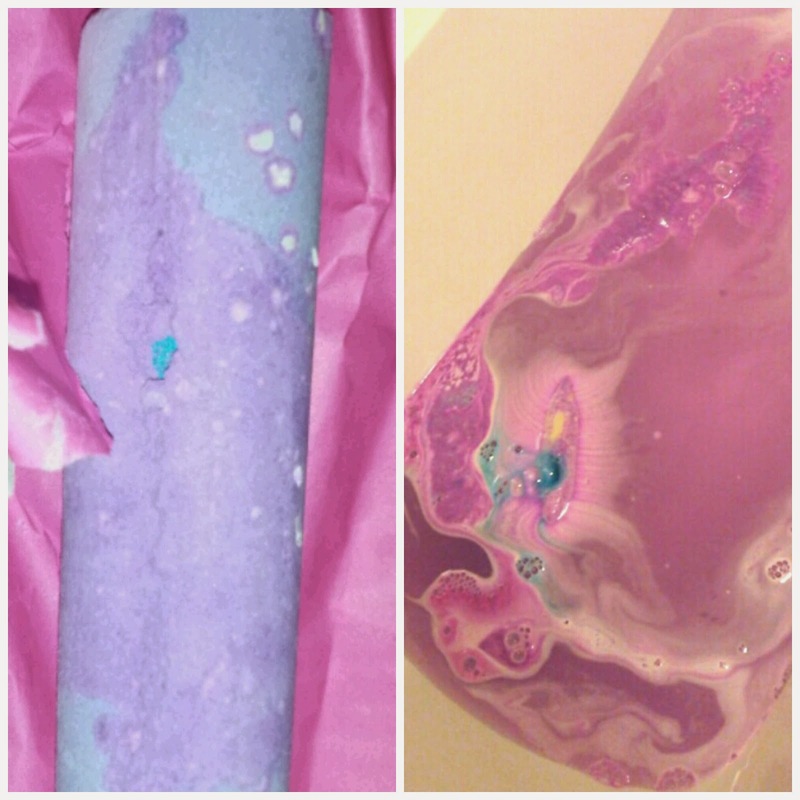 When I put the bath bomb in the water it fizzed fairly slowly. At first there was pink and purple oozing out of it and then spots of bright blue started oozing out too. After a while neon yellow then began coming out of it leaving the water with lots of beautiful colours in my bath tub. It was definitely putting on a show- just like a firework! 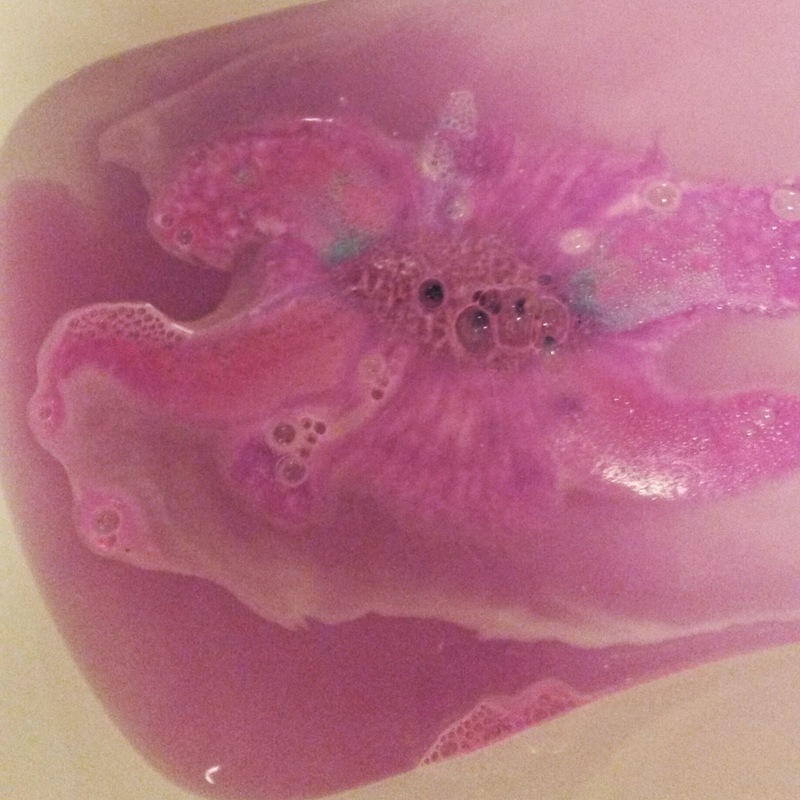 These colours stayed throughout my bath with a stunning pink to purple ombre. There was also a nice smell to the bath bomb. To me it smelled like blackcurrant but the Lush website actually says it has floral notes with Jasmine and Ylang Ylang oil. This bath bomb really was fantastic and I loved every minute of it. Plus at only £3.50 I cannot fault it. I really enjoyed it and would certainly repurchase it and/or buy it for a friend. It definitely would be a great present for someone! Have you used it or had a Lush Haul recently? Let me know! 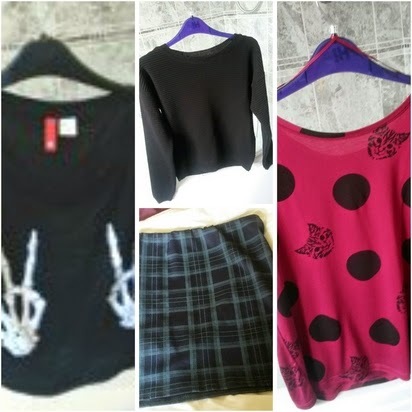 I've accumulated some clothes over the past 2 weeks and I thought I would share them with you. They are mostly formal clothes for Sixth Form (college) and not something I would usually wear. 1) The exception to the formal clothes is this crop top from H&M which I think was £8. 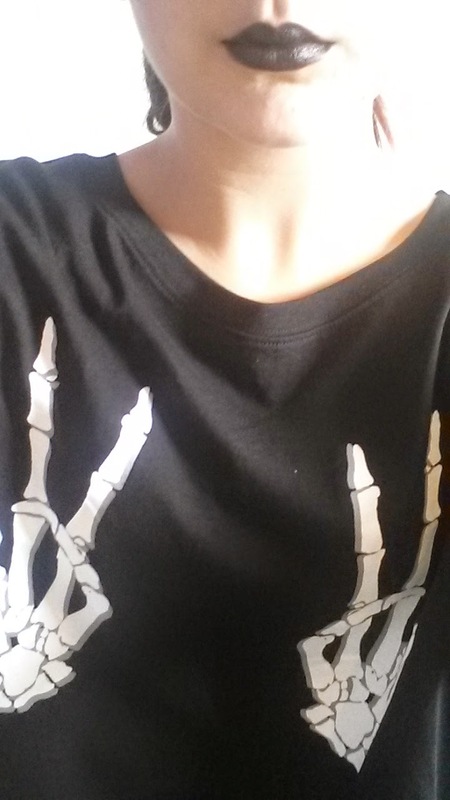 What drawn me to it was the skeleton hands doing peace signs. 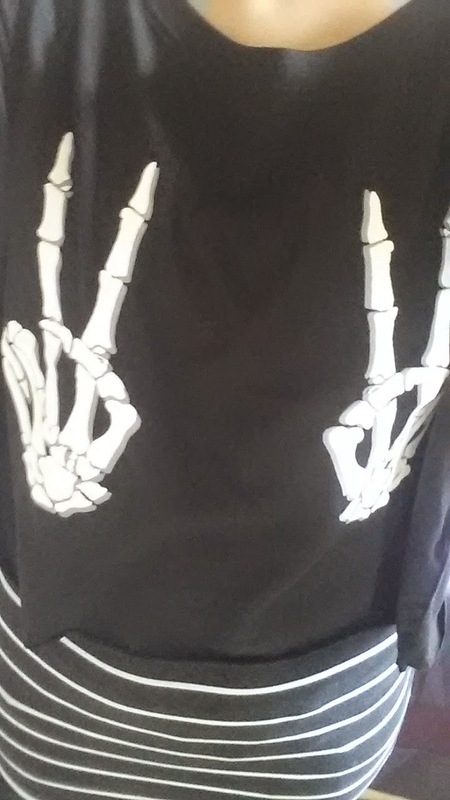 If you know me you know I love my clothing with skeletons on! 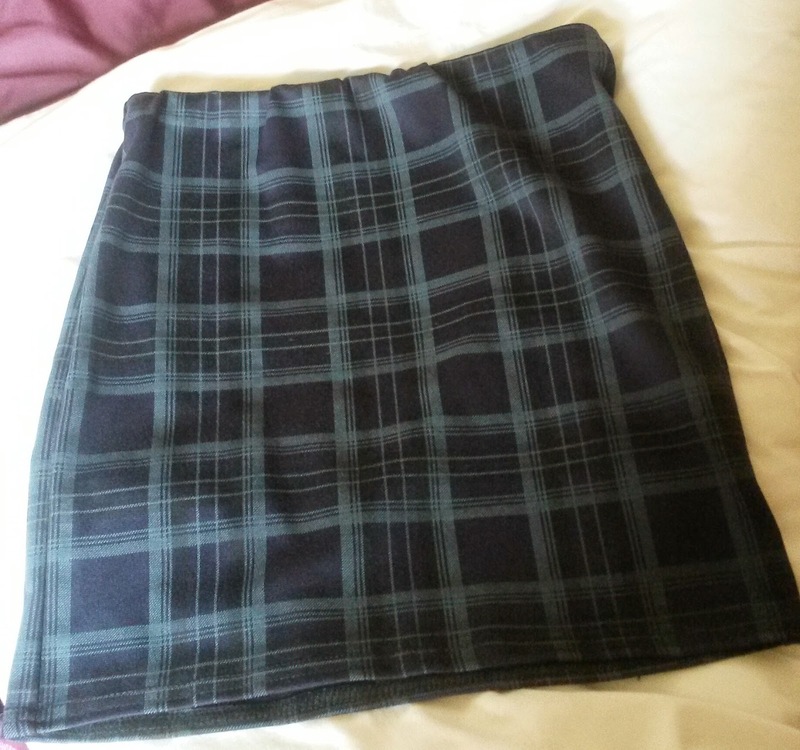 2) This tartan skirt was £12.99 from New Look. I quite like tartan clothing and thought this would be great for the Autumn/Winter with black tights and a jumper. 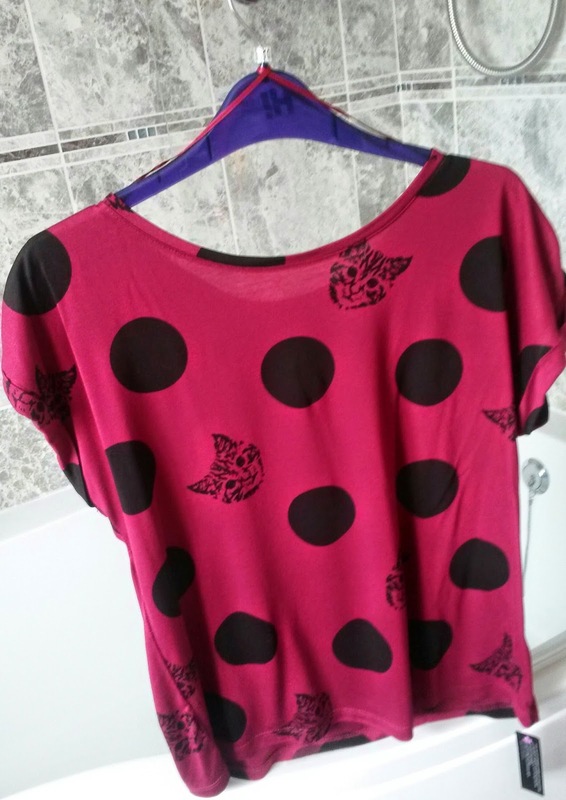 3) My Mum saw this dark red spotted cat top in Debenhams and decided to get it for me as we really are a cat loving family. It is a lovely colour and the cat faces are pretty awesome! This was £16. 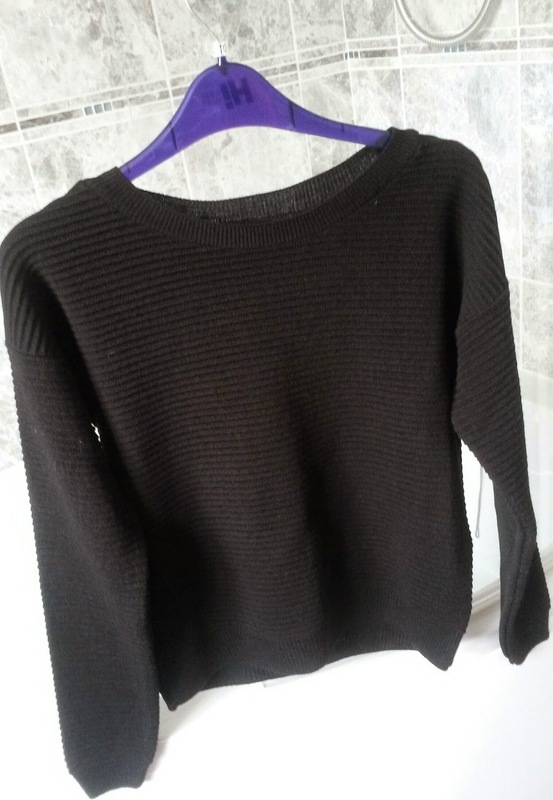 4) And finally is this slighly cropped black jumper with ribbed lines going across it from New Look for £19.99. I thought this would go great with the tartan skirt and would keep me warm in the Winter. I love the ribbed detail also which adds an extra touch to it. When I wear this jumper I like to wear a top underneath with a collar so I can fold the collar over the jumper. Great for Sixth Form and for going out! And that's it! What do you think? Here is a super easy and quick nail art idea for Halloween I have to share with you. I did this last year and could not resist doing it again! 1. Paint your nails with a base coat. To help make the blood look more 'wet' looking you could use a matte coat. However, you do not have to do this- I didn't! 2. 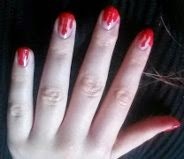 Grab a tool with a rounded point (I used the end of a paint brush) and dip it in to red nail polish. Then, carefully dot three dots near the bottom of your nail at different heights. 3. If needed get more nail polish on to the tool and slowly drag a line from a dot to the top of your nail. Ensure you leave spacing between each line. 4. After you have done your three lines, join them up at the top by using the dotted tool to add curved lines. This really gives the effect of dripping blood! 5. Put on a top coat to the blood. I highly recommend a high shine top coat to make the blood look wet! If you used a matte base coat underneath this will really stand out against it. And that's it! What do you think? Also, what are you going as for Halloween? Let me know! 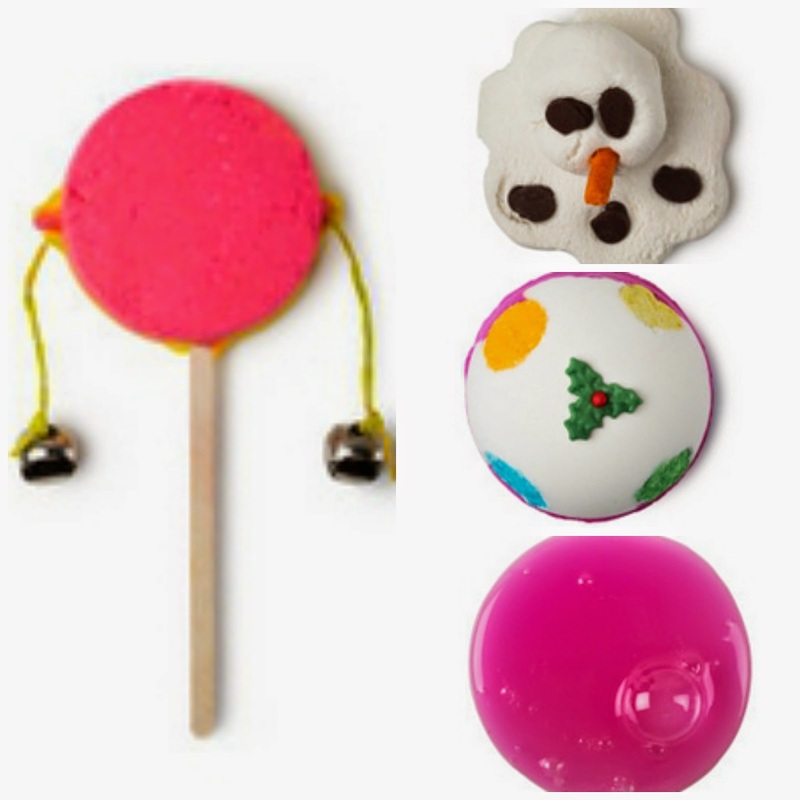 Lush Wishlist Part 2: Christmas! 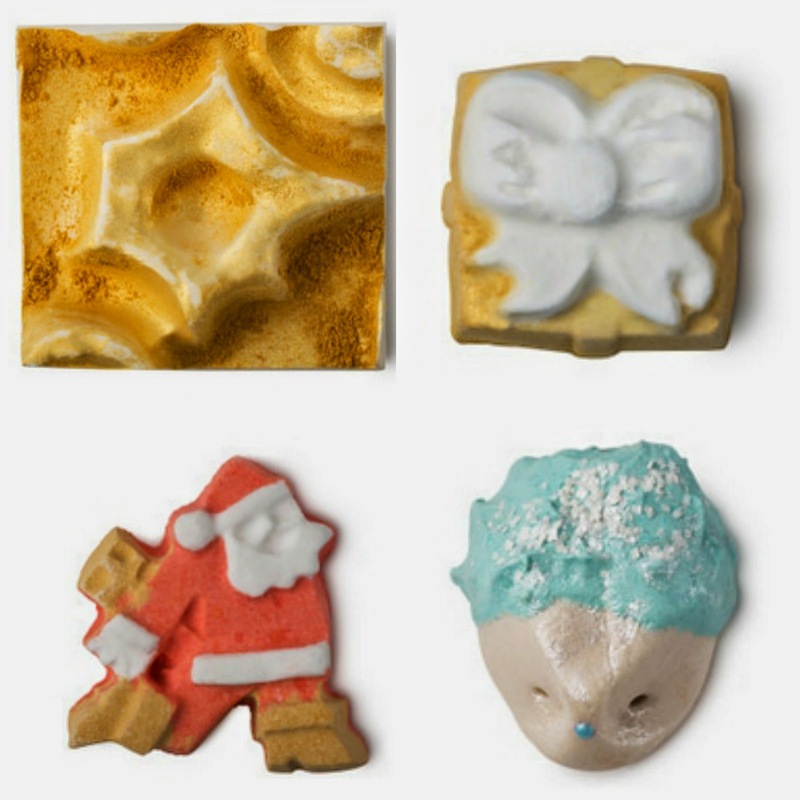 The best products from Lush always come out at Christmas so even though it is a bit too early to get excited for Christmas I couldn't help but check out the products! 1) Drummers Drumming Bubble Bar- This is an awesome looking bubble bar that looks like a drum. You can even shake it to play the bells against the drum! It also lasts quite a few baths which is always a bonus. 2) The Melting Snowman Bath Melt- This bath melt has almond oil and cocoa butter in it so it seems it will make the bath really moisturising for the skin. Plus, how can you resist that little face? 3) Luxury Lush Pud Bath Bomb- This looks amazing. It was on my Christmas list last year but sadly I never got it so I am determined to get it this year! It looks like loads of fun and my favourite types of bath bombs are the ones that put on a show. 4) Snow Fairy Shower Gel- The Christmas classic. I got this last year and I absolutely loved it. It has a sweet bubblegum smell and definitely is one to try out. 5) Snowcake Soap- I received this soap as a gift two years ago after my friend told me it was great for sensitive skin which is what I have. It was extremely nourishing for my skin and stopped my hands getting super dry and skin broken in the cold! 6) Golden Wonder Bath Bomb- Another bath bomb that looks like absolute fun. It is big too so it would definitely be luxurious! 7) Dashing Santa Bath Bomb- This is just too cute to resist! It would definitely be perfect for Christmas Eve. 8) The Christmas Hedgehog Bubble Bar- The only thing cuter than the Dashing Santa bath bomb. We have been getting lots of hedgehogs in our garden this year so it seems fitting that I have an adorable little friend for myself. So there you have it! If I try any of these I will be sure to review it for you guys! What do you want from the Christmas range? Let me know! 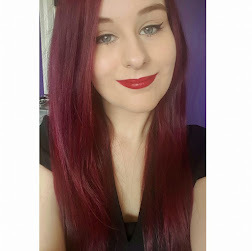 Also, make sure you check out my previous post if you haven't already which was Part 1 of this wishlist for the Fireworks Night/Halloween products. Today I am bringing you part 1 out of 2 of my Lush wishlist which has been inspired by all the new seasonal products they have brought out! This time of year is always best for Lush and every year it excites me greatly. This part is about the Firework night/Halloween products. Fireworks night is something we celebrate in the UK (Google it!) and is also known as Bonfire Night or Guy Fawkes Night. 1) Sparkly Pumpkin- This bath bomb looks perfect for Halloween! 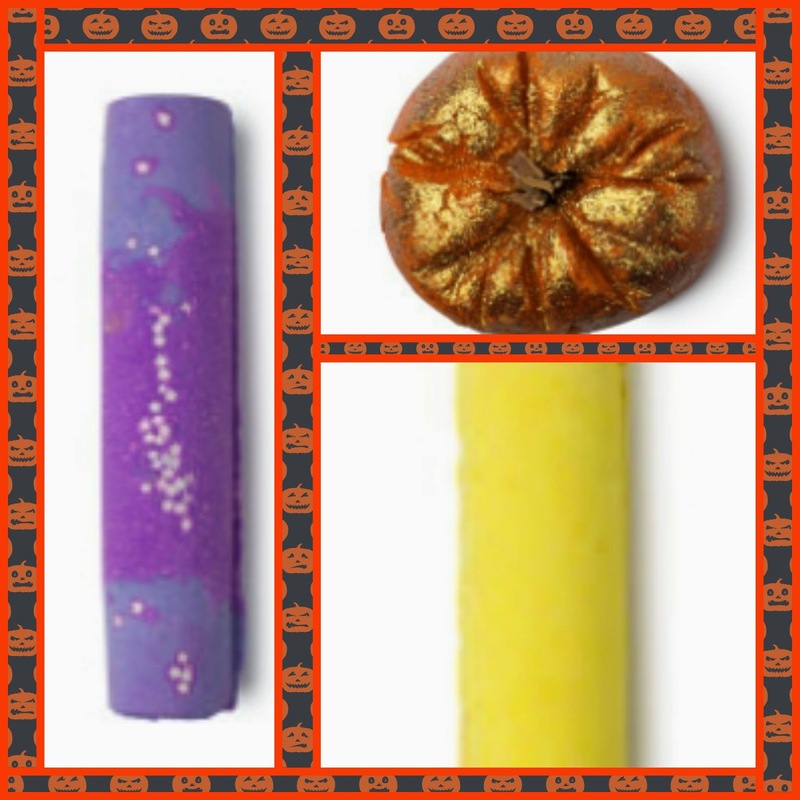 In the shape of pumpkin with a beautiful deep orange and glitter it is bound to be a fun, spooky product! 2) Northern Lights- My favourite type of bath bombs are the ones which go various colours and put on a show for entertainment purposes. The beautiful colours and promise of excitement drawn me instantly to this product and it is the one I would like to get the most. 3) Sparkler- Another bath bomb that promises fun. I cannot wait to use this on Fireworks Night! Do you want any of these? Let me know! Part 2 for the Christmas products will be coming soon. Trust me, that will be a big one! 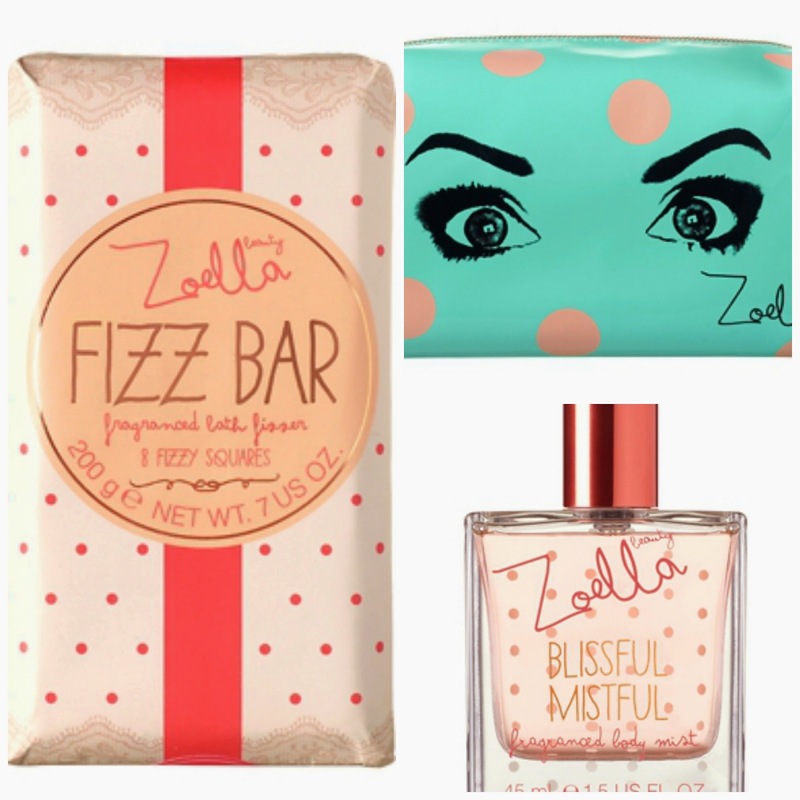 It is common knowledge now that famous beauty blogger and YouTuber Zoe Sugg has released her first beauty line. This is what I want the most. That shade of blue is one of my absolute favourite colours and Zoe's eyes look perfect. I would also really like to try this fizz bar out. I love bath products like these and it seems so cool how it looks like a white chocolate bar that you break off in to squares! It would last quite a few bath times. Finally, I wouldn't mind trying out this body mist. It has such pretty packaging and I'd love to smell what it smells like and see how long it lasts. That's it! Zoe has done absolutely amazing here. In addition, Tanya Burr has more stuff coming out in her beauty range which I cannot wait to see. What do you want to try out from Zoella Beauty? I'd love to know! Hello! It's that time again! These photos were taken from my personal Instagram @BrionyBea but I also have an Instagram for my blog which is @SincerelyBrionyBea. 1) My friend Emily celebrated her 18th birthday at the beginning of the month so this was a photo with her. 2) A photo of me and my boyfriend (slightly drunk) from Emily's birthday party. 3) The same day, me and my boyfriend also celebrated our 1 year anniversary! 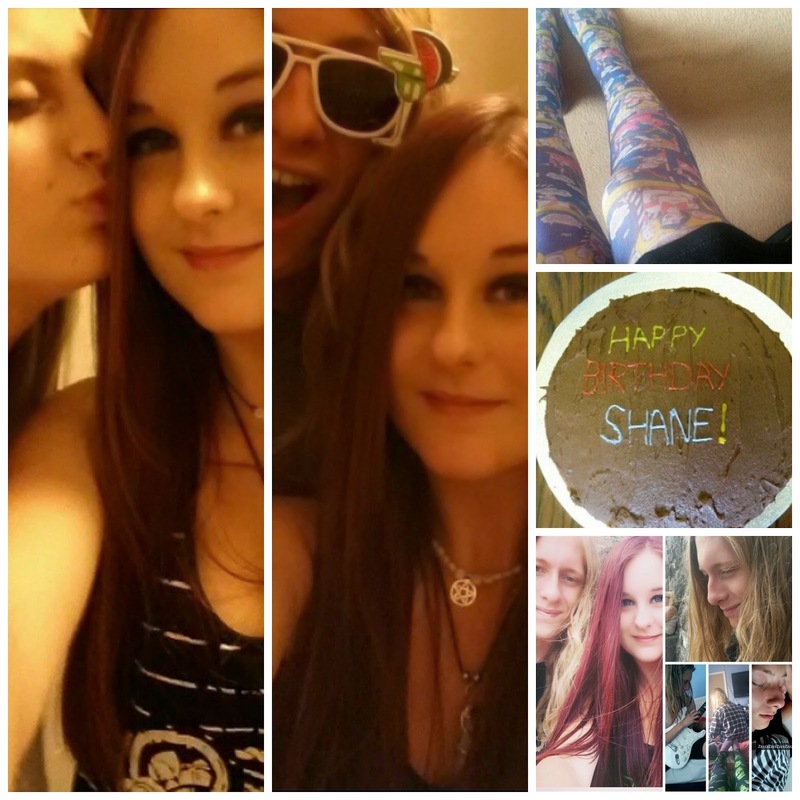 So at the bottom is a collage I had made of photos of us from throughout the year. 4) It was also my boyfriend's 19th birthday so I had baked him a cake. 5) An outfit of the day where I was showing my comic strip tights. I had also uploaded a video in September of the Tour of Britain which is a cycling race around Britain. So there you have it! It seems September was very largely based around my boyfriend but September holds quite a few important dates for us.